Still baffled with your wedding hairstyle? We make it easy for you. Breathtaking. Gorgeous. And the perfect balance between unique and flattery –exactly what every bride should be looking like! From simple ponytails, sleek updo’s to retro waves and textured topknots, we’ve got the perfect hairstyles for your big, memorable day. So, ditch the old hairstyles and try one of these masterpieces instead — you’ll thank us later! Fifty Shades of Grey actress Dakota Johnson shows off her simple yet classy up’do on the red carpet, wearing her beautiful ombre mane with soft bangs. We love everything about this hairstyle – Dakota’s luscious hair and warm hair colour; the soft, face-framing bangs, and the simple ponytail. The beautiful actress polishes off her look with refined eye make-up and bright red lips, complementing her pale complexion. If Gwen Stacy were to sleep on her locks overnight and part them down from the side, these elegant waves would be the final outcome. We so adore Emma Stone’s perfectly neat and sophisticated locks that we are nearly speechless. There’s no kidding how low we might stoop to get the name of the stylist who crafted the chic side-swept bun with that perfect waves at the bottom! Looking for the most striking look for a black tie wedding? Don’t worry, we have you covered. This low in maintenance hairstyle lets you focus more on the face and the dress. The hair is middle part and is tightly pulled back into a bun in the nape of the head, creating a sleek style that’s chic, and yet classy. Take a cue from the Naeem Kahn show and add a touch of wine-red lipstick to pump up your classic bride look. Ella Fanning shows off her beautiful blonde tresses in a stunning, polished high bun decorated with a floral headband over it. The beautiful teen actress matches her stunning up’do with subtle make-up and pretty pink lips – altogether, perfect for your wedding! Model and fashionista Petra Nemcova looks classy and trendy with her chic, twisted up’do. The undone, loose bun accentuates the perfect symmetry of her facial features. To recreate Petra’s gorgeous wedding hairstyle, dab a volumizing mousse throughout your hair. Now take sections of hair from above each temple and twist them behind your back. Secure the updo with bobby pins and mist holding hairspray to keep your bun in place. Actress Blake Lively looks chic and feminine with her messy braided up’do. Braided hairstyles are set to be very popular with the brides in 2015, and with numerous braided styles to choose from, you’re bound to find the perfect hairstyle for your memorable day. Blake’s braided up’do is an ideal look for brides with medium to long hair. Pair the look with long embellished earrings for the final touch. Actress Rose Byrne shows us how to nail a loose, asymmetrical wedding hairstyle with her side-swept, low chignon. Perfect for your big day, the hairstyle is dreamy and eye-catching. Add to that, the look is extremely flattering for long, narrow faces a la Rose. Spice up your side chignon with a dazzling earring and diamante hairband. We simply love Burlesque dance, Dita Teese’s retro wedding hairstyle. What really makes Dita’s hairstyle look up to date is its looks and the really touchable waves that are more deconstructed. To recreate the glam look, begin with drying your hair. Lightly mist a texturizing spray and wind the hair into a hot roller. When rollers cool, sculpt the waves with your fingertips and finish with spritzing of hairspray for a strong hold and a glossy shine. Singer Katy Perry is a wedding hair inspiration for people with bold hair colours. A mix of edgy and chic, the swept back, violet hue locks into a ’60s-inspired updo is actually one of our favourites! To duplicate this look, brush and pull up your hair backwards to a high ponytail. Secure with a hair band. Now, tuck the ponytail underneath and create a big, voluminous bun. To hold this bun, pin it discreetly. 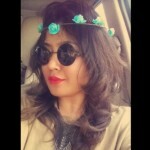 Finish off this delightful look with a gold hair band around the head. Effortlessly chic and feminine as always, actress Sarah Hyland wears her hair in a simple, textured topknot. Going with “less is more”, this look is perfect for a summer wedding! Just opt for natural makeup and a few key pieces of embellished jewellery and you’re good to walk down the aisle. 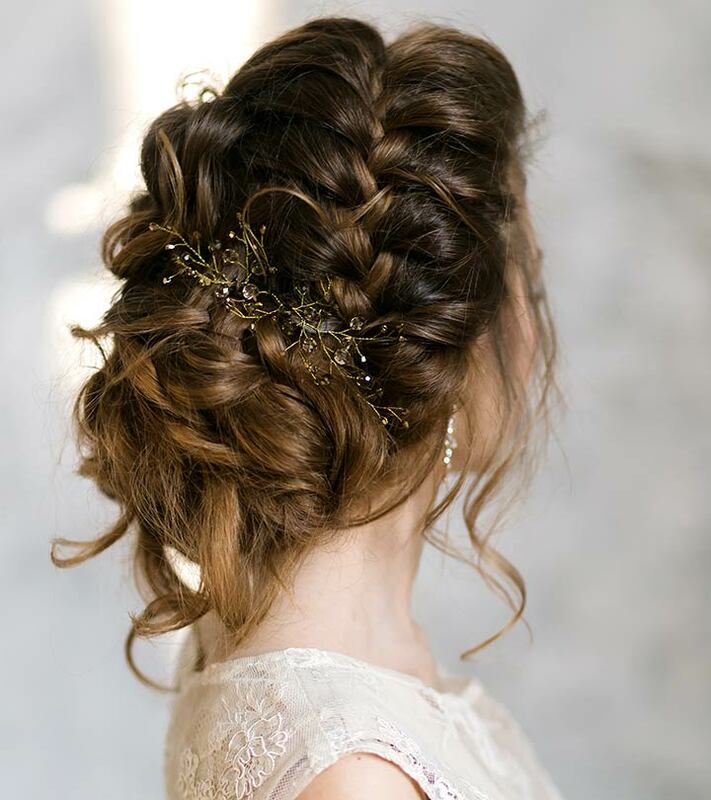 For this messy bridal new hairstyle, after blow drying your hair, take a flat iron and wrap small sections of hair on the top of the head to give a bit of texture. Once done, add extra movement and volume to the roots with the help of volumizing mousse. 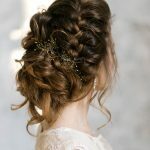 This wedding hairstyle works best with thick hair, that is dirty, (yes, you read it right) especially for the textured style. So, there you have it, our top ten new bridal hairstyles! We hope you’re inspired by these new and gorgeous hairstyles – it’s time to get planning! And let us know how you found this post. You can comment in the box below!